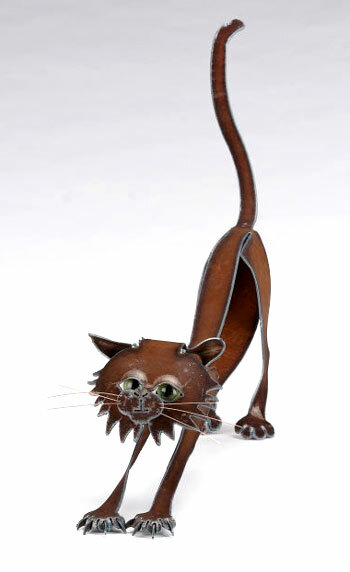 Cat...see what's new in the Henry Dupere cat garden sculpture collection. The cat stretching, cat garden sculpture, with eye-catching, realistic cat-like glass eyes meows for itself. A soon-to-be-classic cat, add this cat garden sculpture to your Henry Dupere collectibles. All of the garden art sculptures in the Dupere collection, can be used to add a touch of distinction to any garden or home decor. "Dogs come when they're called; cats take a message and get back to you later." -Mary Bly." Henry Dupere Stretching Cat Garden Sculpture. Size: 21" Long 19" High. Three-dimensional rusted metal cat garden sculpture. Cat Eyes: realistic taxidermy glass-like eyes featuring superior craftsmanship.